As with both the Arnaud’s Restaurant Cookbook and New Orleans Classic Desserts, Wohl and Pelican have produced another timeless collection of excellent fare from past and present restaurants, establishments and authoritative chefs. The accompanying stories and gorgeous photographs work in tandem to make the pages spring to life and capture the essence of seafood’s significance to the culture and palate of New Orleans. That alone is reason enough to add New Orleans Classic Seafood to one’s cache of prized cookbooks. Indubitably, the brilliant recipes are an absolute must-try at home. 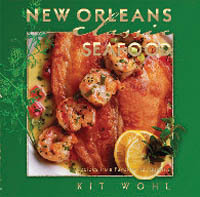 Grouped into sections of shellfish and finfish, with an individual chapter dedicated to various seasonings implemented for certain methodologies such as frying and grilling, Wohl’s go-to compendium for renowned New Orleans seafood dishes covers the spectrum of delicacies culled from familiar waters. Wonderful crab selections include Galatoire’s Crabmeat Maison, one of the most divine ways to enjoy fresh jumbo lump crabmeat, Palace Café’s rich and savory nut-crusted Crabmeat Cheesecake, and festive Jumbo Lump Crab Cakes from Mélange at the Ritz-Carlton, a bold adventure in texture and flavor thanks to the addition of piquanté sauce and fennel slaw. Crawfish, another cherished crustacean in New Orleans, are on display with contributions such as Franky & Johnny’s spectacular Crawfish Pie, which can be made as 12 individual pies or 48 bite-size canapés, and elegant Crawfish Roban from Semolina’s Bistro Italia. Shrimp, a most versatile seafood, shine in unique masterpieces like Upperline’s beloved Fried Green Tomatoes With Shrimp Rémoulade, Herbsaint’s fabulous Shrimp and Tomato Bisque, and Chef Austin Leslie’s unparalleled Stuffed Shrimp. The oyster, New Orleans’ best-loved bivalve, is well represented with Arnaud’s venerable Oysters Bienville and Acme Oyster House’s impressive Grilled Oysters. Fish and seafood combinations include Commander’s remarkable Palace Pecan Encrusted Trout, Redfish Grill’s sublime Redfish With Crabmeat and Lemon Butter Sauce, and Chef John Besh’s stellar Creole Bouillabaisse. New Orleans is duly blessed with an abundance of both fresh seafood and creative kitchen artisans who are experts at transforming seafood into magical, succulent dishes. Wohl is to be commended for crafting a beautiful, functional and honorable amalgamation of top-notch classic New Orleans seafood recipes contributed by those who are unquestionably superlative at bringing out its best in the kitchen, one that is anything but washed up. For the sauce piquanté, heat the olive oil in a 12- inch saucepan over medium heat. Sauté the garlic, jalapeños, onions, celery and green peppers, about 3–5 minutes. Add the tomato juice and tarragon, reduce heat. Simmer over low heat for 10 minutes. Stir in the diced fresh tomato and heat about 1 minute. Remove from the heat and set aside. To create the fennel slaw, toss the thinly shaved fennel bulb with the cane vinegar and set aside. Crab cakes must be gently handled to avoid breaking the lumps. Combine the red onions, bell peppers, mayonnaise, mustard, horseradish, fresh thyme, Italian bread crumbs and mix well. Gently fold in the jumbo lump crabmeat. Add the cayenne pepper, salt and freshly ground black pepper. Taste and adjust seasonings as desired. Divide the mixture into six balls. Flatten to make the cakes. In a nonstick skillet over medium heat, sear the crab cakes on both sides, turning once. Ladle piquanté sauce onto a serving platter or individual plates. 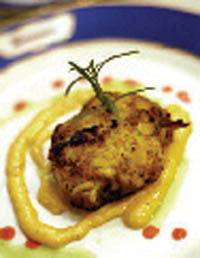 Place the crab cakes on top of the sauce and garnish each with 1 or 2 teaspoons of the fennel slaw. Serve immediately.